This paragraph about Mt. 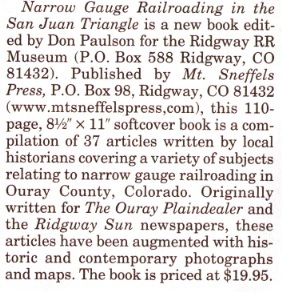 Sneffels Press’s book, Narrow Gauge Railroading in the San Juan Triangle: The Rio Grande Southern, the Ouray Branch of the D&RG and Otto Mears’ Silverton RR, appears in the January 2010 issue of Railroad Model Craftsman. You too can have your own copy by clicking on this link to our catalog. Click here to go to the Railroad Model Craftsman website.